To those who travel there today, the West Indies are unspoiled paradise islands. Yet that image conceals a turbulent and shocking history. For some two hundred years after 1650, the West Indies were the strategic center of the Western world's greatest power struggles as Europeans made and lost immense fortunes growing and trading in sugar-a commodity so lucrative it became known as "white gold." Matthew Parker vividly chronicles how the wealth of her island colonies became the foundation and focus of England's commercial and imperial greatness, underpinning the British economy and ultimately fueling the Industrial Revolution. Yet with the incredible wealth came untold misery: the horror endured by slaves, on whose backs the sugar empire was brutally built; the rampant disease that claimed the lives of one-third of all whites within three years of arrival in the Caribbean; the cruelty, corruption, and decadence of the plantation culture. 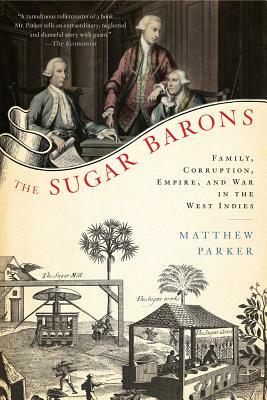 Broad in scope, rich in detail, "The Sugar Barons "freshly links the histories of Europe, the West Indies, and North America and reveals the full impact of the sugar revolution, the resonance of which is still felt today. Matthew Parker was born in Central America and spent part of his childhood in the West Indies, acquiring a lifelong fascination with the history of the region. He is the author of Panama Fever, the story of the building of the Panama Canal, and Monte Cassino: The Hardest Fought Battle of World War II. He lives in London. Visit his website at www.matthewparker.co.uk.